Is it fall yet? anywhere? 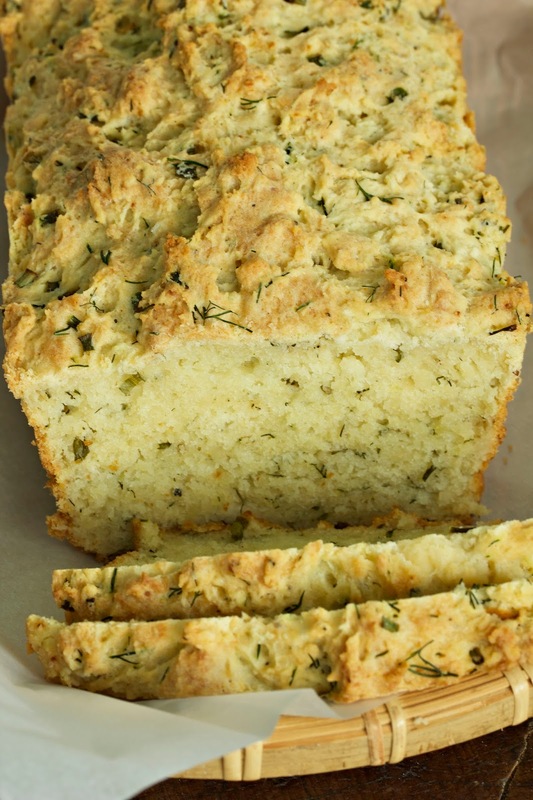 I can hardly wait to dip a thick toasted slice of this savory herb bread in a bowl of butternut squash soup,* both modified for non-dairy dietary restrictions, of course. Dairy products (except for grass fed butter) are in the "Red Zone" on the Paleo diet. But I first noticed I was becoming lactose-intolerant years before I knew about Paleo by, of all things, the zucchini bread at Peet's Coffee & Tea. It took awhile to figure out that any food made with milk, buttermilk or cream wasn't going to be a good choice for me. So time to make adjustments. Soups are easy; substitute coconut milk or use chicken broth. But baked goods are more of a challenge. 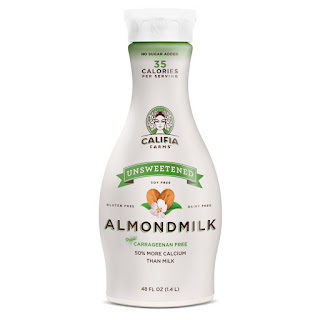 Thank goodness for Califia Almond Milk - and the cheese expert at Whole Foods. He has guided me to Kite Hill products on multiple occasions. 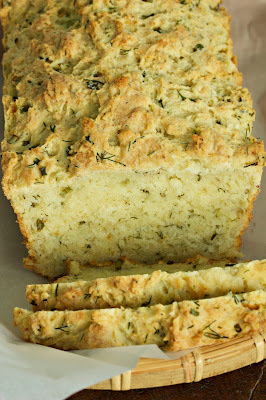 For this bread, he recommended non-dairy ricotta as a substitute for cottage cheese which worked perfectly in terms of texture and taste. The chef that created this recipe was going for a ranch dressing flavor palette. It's delicious toasted with jam for now, but I made another loaf to freeze slices for some serious soup dipping when the first evening chill hits the Bay Area. Preheat oven to 350 degrees F. Grease a bread pan with butter. 1. Whisk the flour, onion powder, garlic powder, salt, pepper, baking powder and baking soda in a large bowl. 2. In another bowl, whisk the almond milk w/ lemon, melted butter, dill, chives, eggs and ricotta together. Pour into dry ingredients and mix with a rubber spatula until all the dry ingredients are absorbed. 3. Pour the batter into the bread pan. Bake on the middle rack for 40 minutes and check for doneness with a wooden skewer. Bread will be done will skewer is clean, and the top is browned. 4. When the bread is done, place the pan on a wire rack and let cool for about 15 minutes. Flip the brea onto the rick and let cool for at least another 15 minutes before serving. Best eaten fresh, the bread can also be wrapped lightly in plastic wrap and stored at room temperature for up to 3 days. It can also be frozen for up to 3 months. Recipe adapted from the kitchn recipe for Easy Ranch Quick Bread, link here. *See "Potimarron Squash Soup w/ Saffron, Orange Zest and Caramelized Seeds" and "My Thai Coconut Curry Soup" for soup recipes. 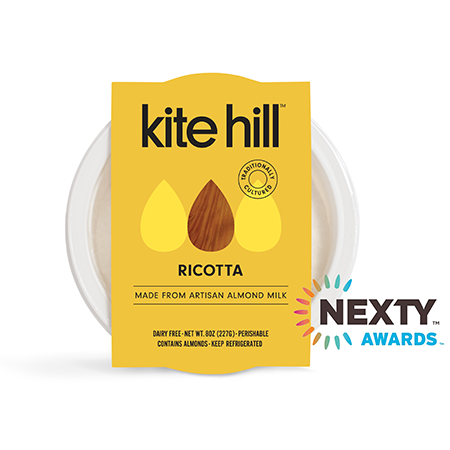 For a link to Kite Hill Farm products, see here. 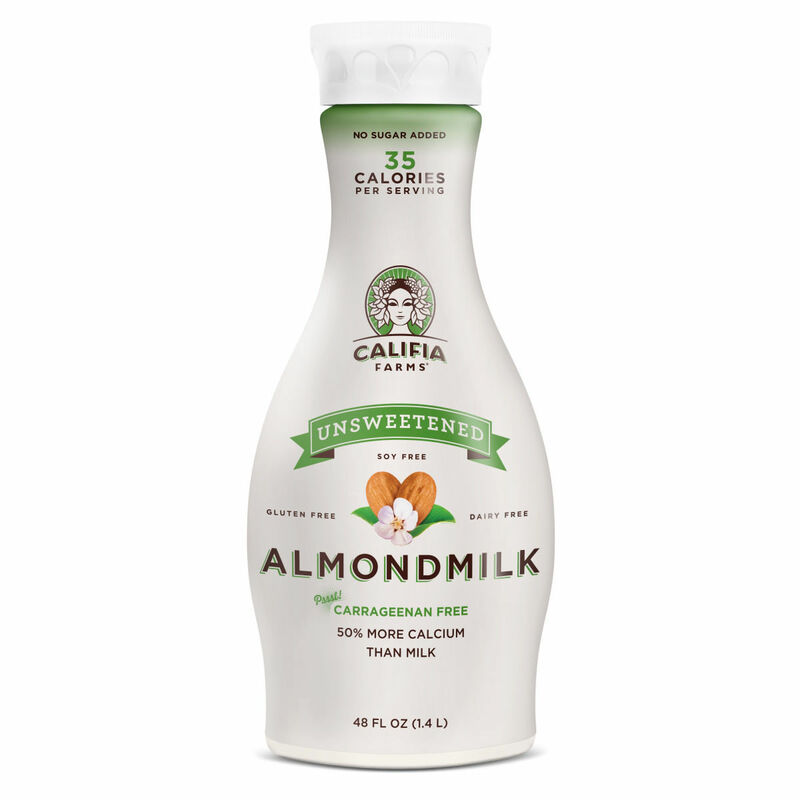 For a link to Califia Almond Milk, see here.